The bride in her bright red lehenga has become one of those images used on brochures that explain India in three minutes. Right up there with the Taj Mahal, a tribal woman from Rajasthan, the backwaters of Kerala and the Qutub Minar. 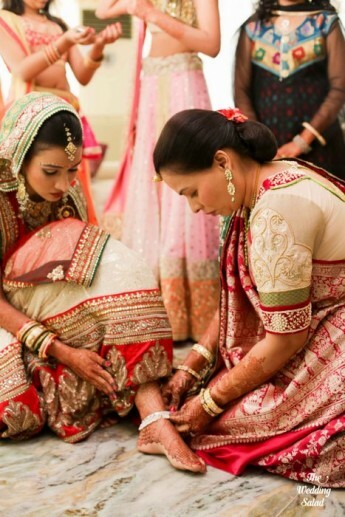 Though the lehenga is quite the bridal symbol, India and its many states have an entire arsenal of fascinating bridal wear that never makes it to those pamphlets (and Hindi movie montages). 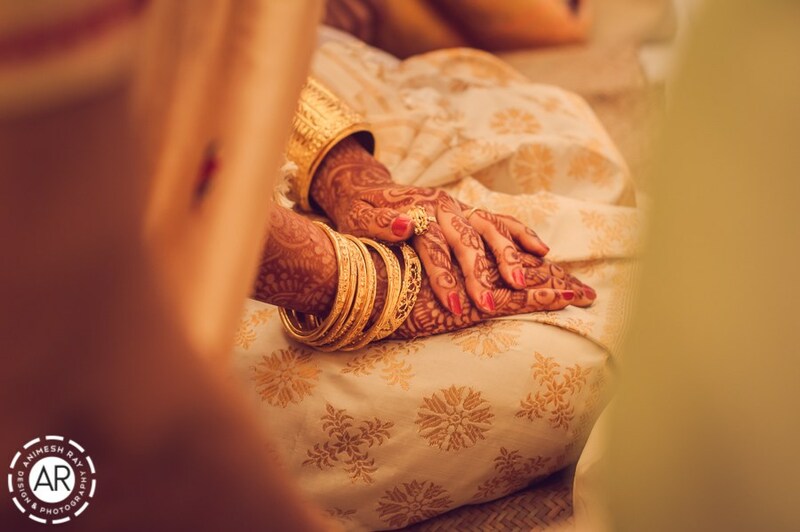 And while there are countless others, we’ve delved into the symbolism, the significance behind five Indian bridal attires. 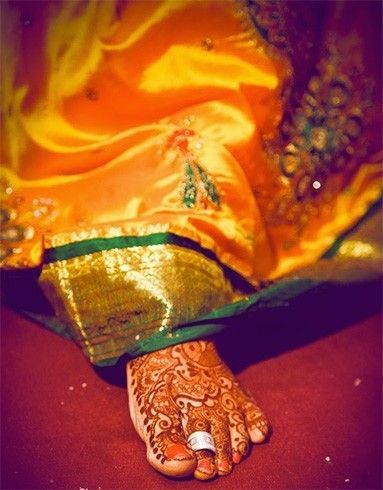 There’s symbolism in every little detail of the Maharashtrian bride’s attire. The yellow and gold color of her traditional woven Paithani saree is for good luck and fertility. The nath (nose ring) is always made of pearls because the stones are supposed to have a calming effect. Odd numbered green glass bangles, interspersed with gold for fecundity and prosperity. 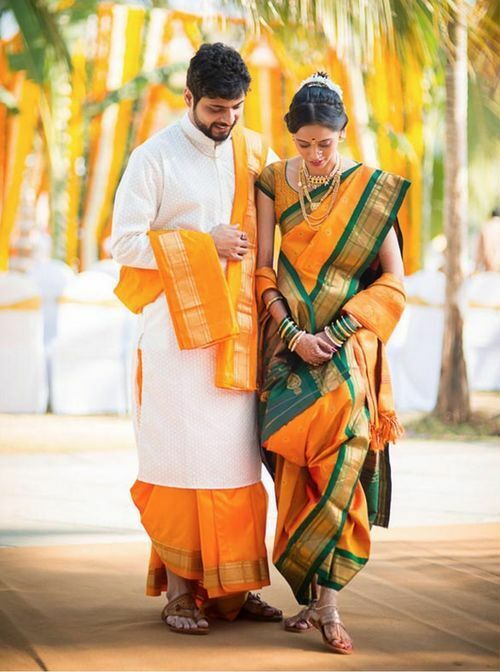 Amrita Pai, a dentist from Mumbai, says that most brides wear a six-yard saree though for her wedding in January, she chose to wear a Navvari (nine-yard) drape that is worn like a dhoti. 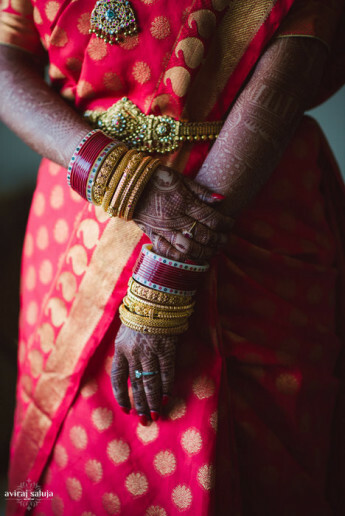 “Maharashtrian brides aren’t expected to cover their heads but have to wear a gajra and a Mundavlya (an ornament made of pearls across the forehead). 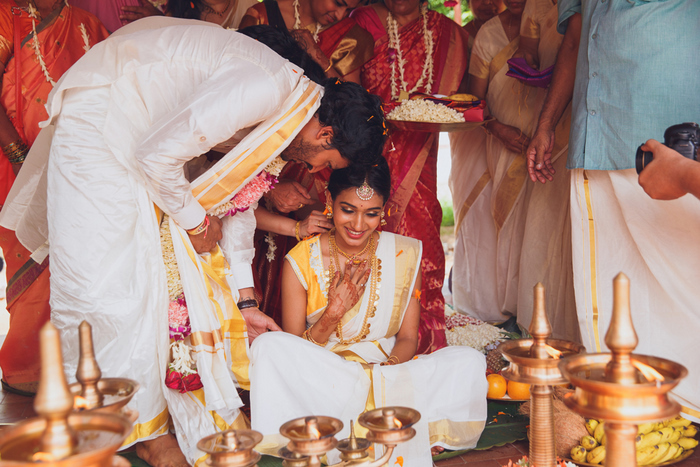 It means the girl is ready to step into the mandap,” says Pai. The Paithani is woven in Yeola, a small town in Maharashtra and carries subtle signs. The saree’s main motifs are peacocks, other birds and the paisley. The value of the saree, and in essence of the girl’s family, is measured by the number of peacocks on the pallu – 9 or 12 is a good number. Another marker is the Kolhapuri saaz (chunky necklace made of 10 real gold beads). Striking white instead of ubiquitous red. 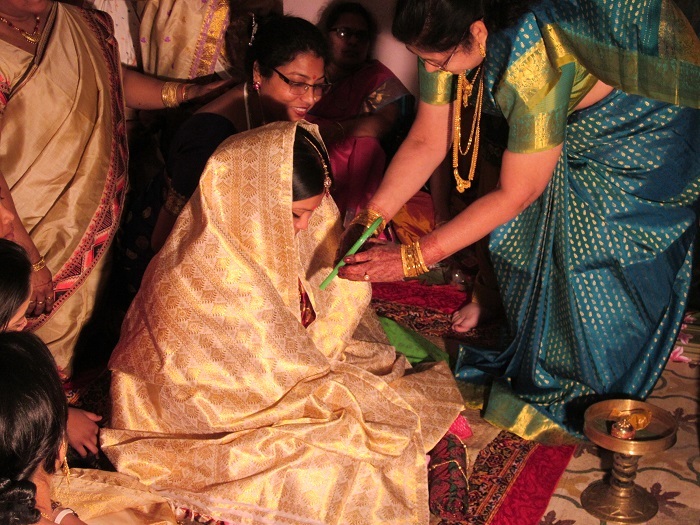 Brides in Assam turn to the traditional Mekhala Chador, when dressing for their wedding. The off-white and gold garment, woven in pat silk (lighter than other silks), is made of three pieces: the mekhala, a length of fabric tied around the waist or with a petticoat; a matching ‘chador’ draped over the shoulders and tucked into the skirt; a matching blouse. Shivani Kagti, a home baker who got married in December 2015, reinterpreted the chador. “I fashioned the fabric into a saree. It was easier to wear but looked as traditional.” Mekhala chadors are woven in Sualkuchi, a small town in Assam near Guwahati. 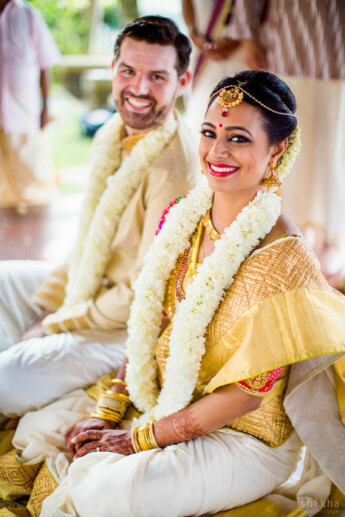 Jasmine flowers, an abundance of gold and a off-white Kasavu saree – you can spot a Malayali bride from a distance. Both Catholic and Hindu brides from Kerala necessarily wear this saree. And while Muslims from the state aren’t traditionally supposed to, it isn’t uncommon to see them wearing one too often with colorful blouses. While women of all ages, married and unmarried, wear this saree, the bride’s garment stands out because of the width of the woven gold border, which symbolises prosperity – the broader the better. “The palakka necklace (gold with green stones) is another element of the outfit. This is usually an heirloom piece that is given to the bride along with the saree. Mine is at least seven generations old,” says Sumita Nair, a finance professional in Delhi. 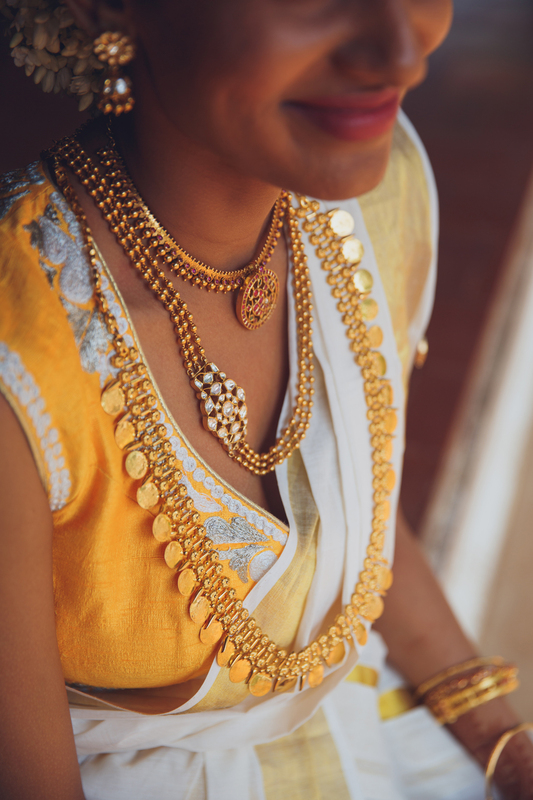 A jewelry lover’s delight, the Tamilian Brahmin bride is a study in gold. She wears traditional temple jewelry in her neck, ears and hands. 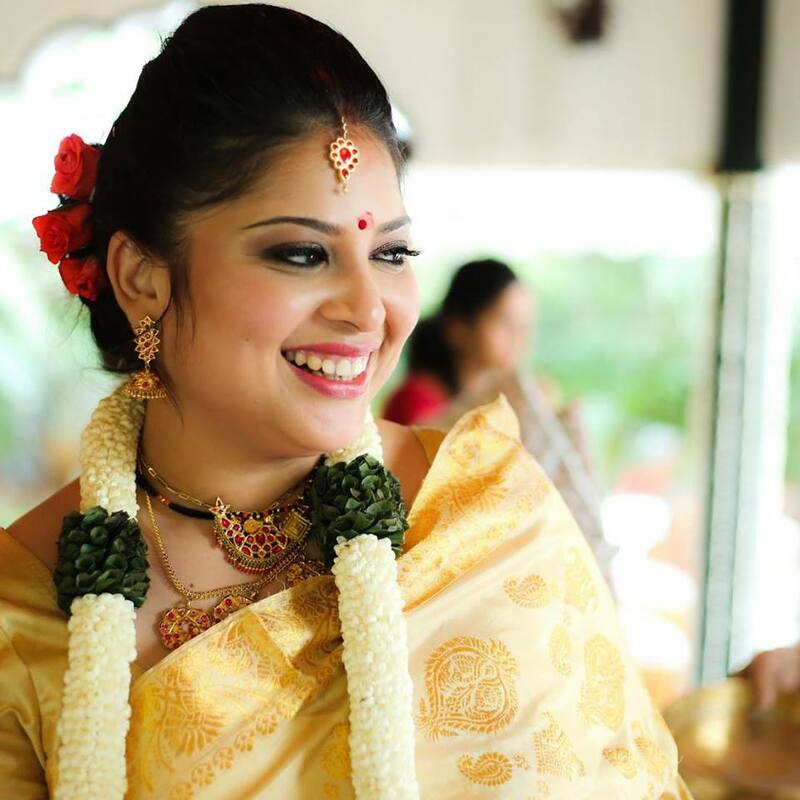 She wears the chandrakala and suryakala (gold discs) on her head, a thick gold kamarpatta (waist band worn over the saree pallu and pleats) and a jadai nagam (a gold ornament worn on the entire length of the braid). This is finished with fresh jasmine flowers in the hair. 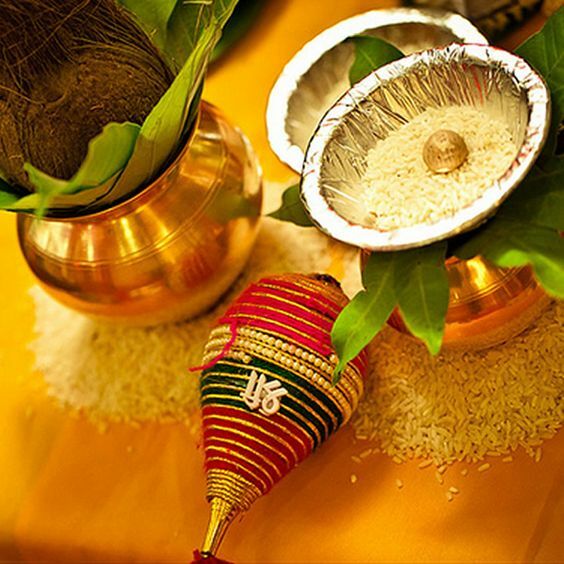 The nine-yard Kanjeevaram that is synonymous with the bride is called koorai podavai and is draped in the madisar style. Interestingly, different communities wear the saree in their own way. The Iyers drape the pallu (the layer of the saree that comes over one’s shoulder) over the right shoulder while Iyengars wear it over the left. 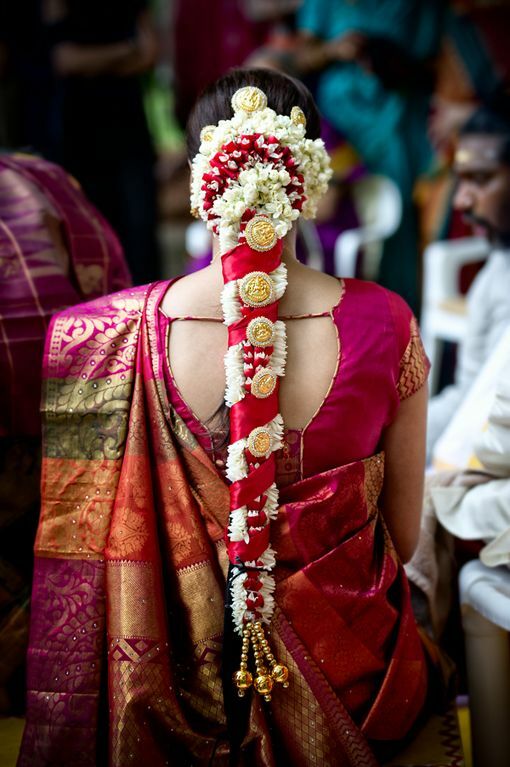 The bride also wears the chotti-vattam (maang tikka) as well as a traditional arm band known as the vangi. It doesn’t end here. 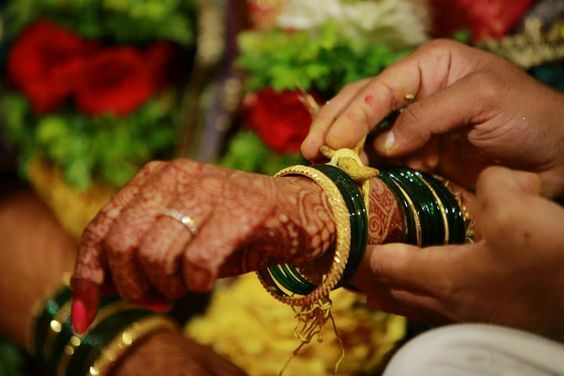 The bride changes sarees around five times where one is a gift from the in-laws. 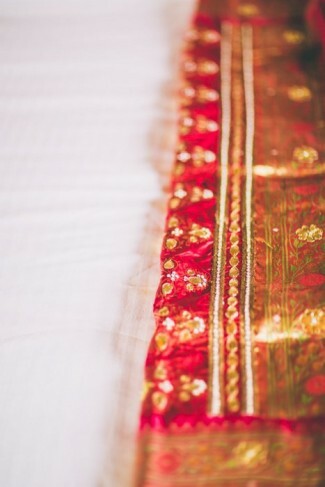 Often called just the Gujarati saree, the red and white Panetar saree is a traditional favorite. 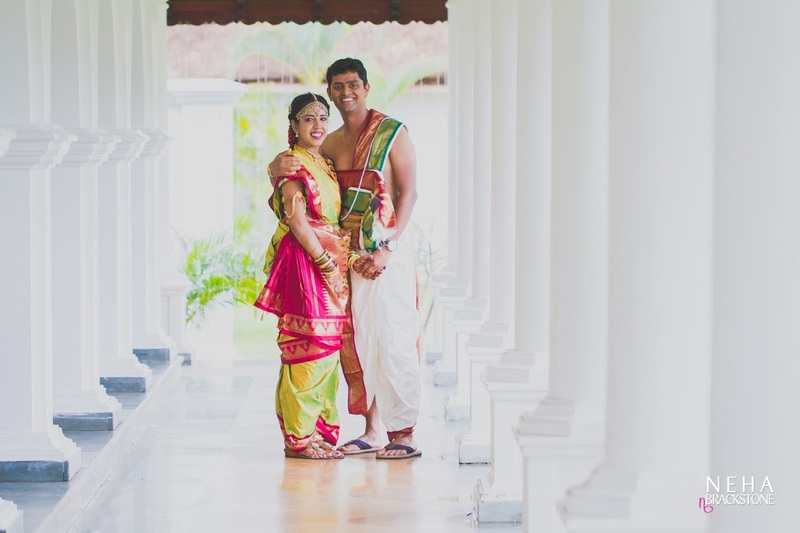 “I didn’t want to drape mine traditionally but was very sure that I wanted to wear the Panetar. So I got mine made into a lehenga,” says Amishi Shah, an interior designer from Mumbai. The Panetar and Gharchola are both an important part of the bride’s ensemble. The former is a gift from her maternal uncle while the Gharchola is from the in-laws. Brides usually wear a Panetar and cover their head with the Gharchola, straddling both worlds with equal ease. The Panetar is usually made of silk with a white body and red border with gold zari work. The Gharchola, the more recognisable of the two, is dyed red with gold weaving in a grid pattern. 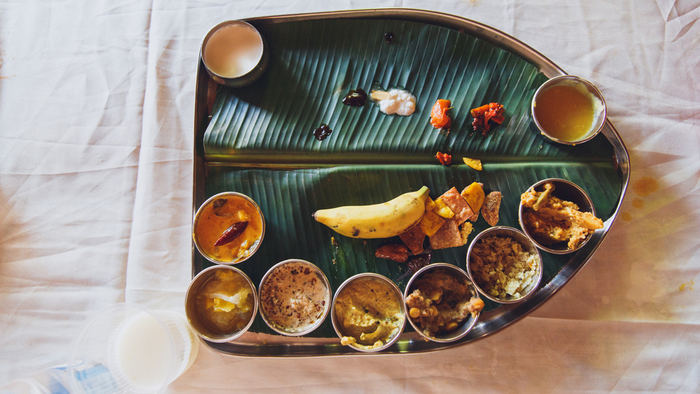 This technique originates in the region around Khambat in Gujarat. Featured image by Suman Chakri. Posted in Assam, clothing, Crafts, Embroidery, fashion, Incredible India, India, indian, inspiration, saree, Sarees, Sartorially Set, style, Textiles, traditional, Weaving, Women and tagged Assam, beautiful, blouses, Bride, colorful, fashion, Gold, Gujarat, Jewelry, Kanjeevaram, kerala, lehenga, Love, Maharashtra, Malayali, mumbai, Navvari, paithani, Panetar, red, Sarees, style, Tamil, Traditional, zari. Bookmark the permalink.